Eliminate waste, encourage responsible behaviour and make users and departments accountable for their usage. 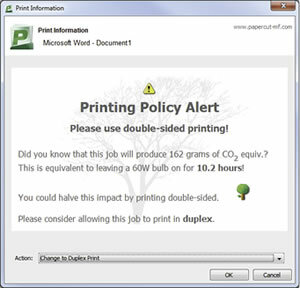 PaperCut MF includes embedded software that runs on your copier/MFD to enable tracking, control and secure print release directly from the device's panel. PaperCut MF is easily configured and suitable for sites of any size regardless of environment, platform or MFD/printer make and model. PaperCut's solutions are currently in use in over 50,000 sites worldwide and translated into 20 languages, making PaperCut MF a product you can both trust and easily afford. and manage. System administrators have full access to administration and configuration via familiar web interface. 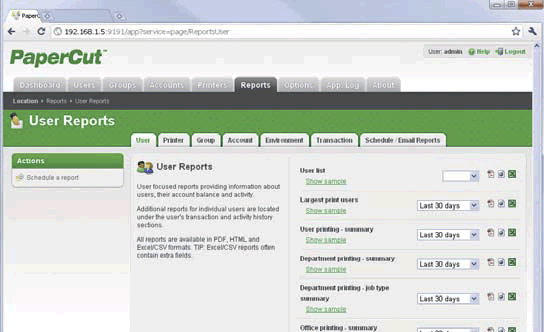 PaperCut includes over 50 one-click reports available for online viewing, printing or export. Reports address all areas ranging from detailed page logs to summaries by user, department, device or environmental impact. Administrators can create ad-hoc reports by applying filter conditions and repoirts can be emailed to specific people on a regular schedule.